The Nintendo Switch has quickly become a premier and popular console for gamers. It’s only been on the market a few months but sold huge numbers of hardware and software. It’s incredibly more successful than its Wii U predecessor which bodes well for basically any title released. Some of that statement could even be said for the Pokémon franchise. No matter what console a Pokémon game is released on, there is going to be plenty of interest for both the system and game to sell well. That’s why Pokkén Tournament DX has made its way to the Switch. After moderate success on Wii U, this series has found a new home. There are many areas which have remained unchanged between the two. Storyline hasn’t really altered, you still rise up the ranks to take on challengers while figuring out what is going on with a mysterious Pokémon. One feature I found fun is the attempt to complete miniature missions to unlock achievements and bonus items. It gives players more of a challenge and could force them out of a comfort zone. One such example is to use a certain Support Pokémon in matches. But if you don’t particularly enjoy using that one then you’re going to have to push through and try winning no matter what. It’s a good idea to have this as part of the tournament mode but putting some of the achievements into single battles would have been helpful in terms of replayability and something to do in order to kill some time. The inclusion of a daily challenge is also a great idea. There could always be something different. While it won’t force you to perform certain moves in order to succeed, it sort of suggests it just to make you try something new. However, you may have to use Pikachu even if it’s not your main. Then, the next day pits you against three opponents in Team Battles which are also new. You are pit against a team of three Pokémon, if yours wins then you face the next one. If you lose the first match you’ll have to use your back-ups. No matter what kind of event occurs from the Daily Challenge, it’s enjoyable to keep coming back to. 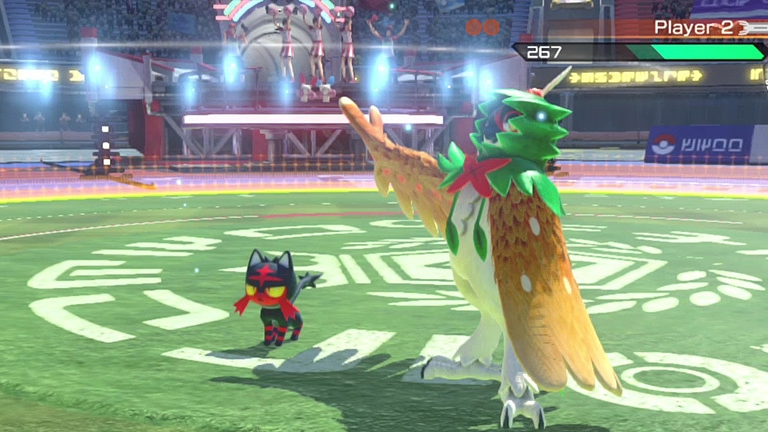 Pokkén Tournament DX still utilizes two modes during each fight. Depending on which attacks are landed, the battlefield will shift from the long distance Field Phase to the close up Duel Phase and vice-versa. When the switch occurs some of your Pokémon’s attacks will change. These are the basics which haven’t changed. The same goes for crisp graphics and action. The gameplay is still as enjoyable too, pulling off combos and checking out various real Pokémon attacks is a treat. All the same stages and support Pokémon are back and offer further Easter eggs than last time. It is perfect for fans to check out every detail as there is always something different to see. 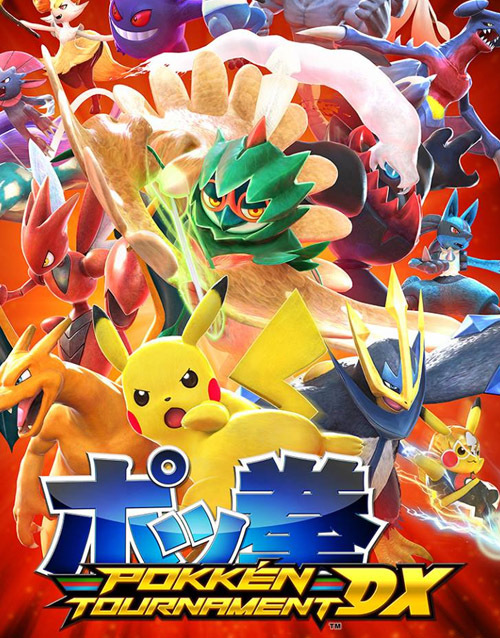 Including new fighters in Pokkén Tournament DX is crucial to bringing it success. We’ve grown used to the previous competitors since last year which is why adding the arcade-only brings so much more strategy to the fold. Fans learned about each new Pokémon in the months leading up to the release but they include: Croagunk, Darkrai, Empoleon, Scizor and Decidueye (only found in DX). These few bring something new to the fray and it’s immediately noticeable. 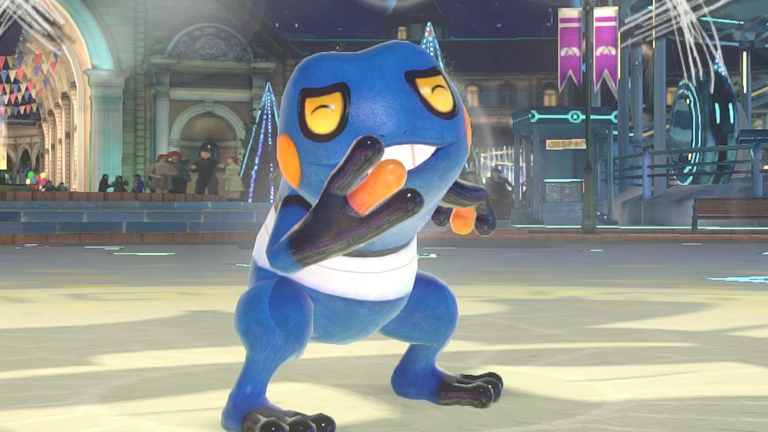 Croagunk is mischievous and snarky, which reflects in its moves as well. 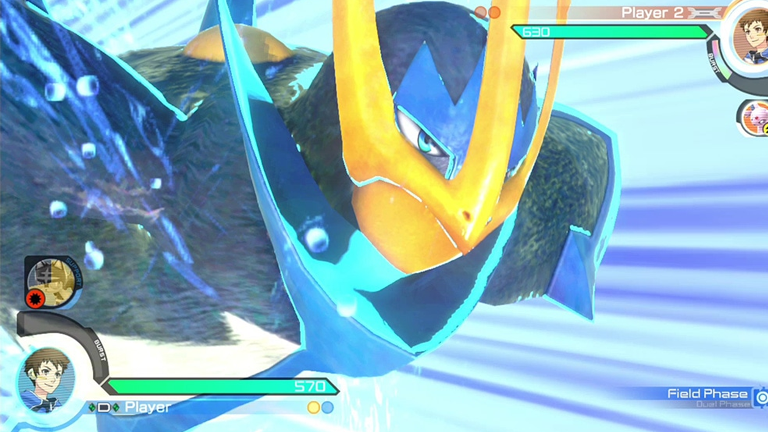 Empoleon is slow to move, but can come at you in unexpected bursts. The addition of new Pokémon is undoubtedly one of the main draws. It’s fun trying out something new. Last time I was drawn to Chandelure, but because this is a new game, I wanted a fresh start and went with Croagunk. You could see it as the underdog with so much attitude. It was great to use long distance attacks at the beginning of matches while switching over to speedy moves when things close in. There are a couple of new stages to check out as well. An underwater dome and dragon shrine are among the choices. Each is still chock-full of interesting background Pokémon and scenery to enjoy. During two player mode, all I did was try and spot everything from various angles. One or two more stages would have been nice though. The Pokémon world is very diverse but a couple of them were repeated. Perhaps even creating places for each type would have been a nice little homage. Fill them with Pokémon to match and there’d be plenty more for fans to love. The variety of options is already good but could have been much greater. Multiplayer options are a highlight of the Switch version. It automatically allows for two players to duke it out and that’s where Pokkén Tournament DX shines. Fighting games should not be played alone which is why the Switch is perfect for two people to have fun. Each Joy-Con offers the same functions as a Pro Controller and others. They may be small, but that is to be expected. If you’re going to get competitive, then pick up a Pro Controller, but the Joy-Con is perfectly capable for just enjoying time together. Being able to play against a friend on the Wii U version would have been complicated unless there are extra controllers. So those looking to participate in friendly competitions with anyone while anywhere can do so on the Switch. While there necessarily aren’t any flaws in what can be experienced, there just isn’t enough content to keep constant interest. New Pokémon, perfect. Added stages, great. Different modes, cool. But that’s basically all there is. Characters are plain, which makes them so unimportant. Accessories and titles probably aren’t worth showing off since they are hardly seen in-game by others. Giving emphasis to achievements and rewarding players is necessary and would have benefited from more of a focus. These observations are no reason to not play the game, but they wouldn’t convince someone they must. I’ve attempted to stick to reviewing Pokkén Tournament DX on its own merits and not compare it too much with its predecessor. Of course this is the definitive version and superior choice. Fans of Pokémon will have a good time checking out the title. If there is any future content coming or major league gaming events, then it will have a bright future. Regardless, its entertaining gameplay should appeal to Switch owners and earn it a deserved fanbase.